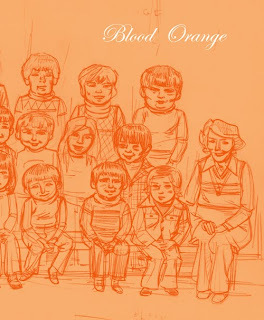 I actually read this edition of Blood Orange first, waiting for my wife before we headed down to SPX 2008. I think the idea was to prepare for indie comics work by grabbing a short grouping of indie comic stories. As with Blood Orange 1, this is a set of short stories by a variety of writer/artists with no two creators working exactly alike. The biggest difference is that with less contributors, each story can be a bit longer. That means that Cole Johnson's Eighteen gets to run five pages of teenage angst and Chris Wright's touching story of a lonely astronomer gets 18 pages to say everything he'd like. The tale of a man doomed not to be able to touch that which he truly loves would not work in the seven pages allotted to the longest stories in the first edition. Helge Reumann doesn't need a lot of space to show a rather humorous out of body experience, as a dead man frantically sees how helpless he is to prevent damage to his dead carcass. Not everything needs a lot of space to work. Reumann's use of heavy black ink and strong art likes really helps the narrative. I'd like to see more of her work. The only person I knew in this group was Jeffrey Brown, and he checks in with one of his little stories from his life, this time about narrowly avoiding a ticket. Brown's stories rely on your ability to relate to him, and I do. If you find his other relationship work boring, however, this is not seeking out just to find a short Brown story. Lauren R. Weinstein has another one-page comic, this time a sort of choose-your-own-illustration that I thought was kinda neat, and then just a bit later, Rebecca Dart breaks the fourth wall all over the place (literally) in a two-page spread that does a lot with very little illustration. Tobias Tak only gets one page this time, but uses it well to tell a funny little riff on the granting a wish them, while Ron Rege, Jr. closes things out with a flatulent bunny that is equally funny. Overall, I think the quality level in Blood Orange 2 is a bit higher than the first volume, and it might have actually been a better place for me to start. If you want to see what Blood Orange is all about, this is probably the one to pick up. Just be warned--this is an anthology of creators on the edge of comic creation, so it's NOT for everyone. I, however, enjoyed it quite a bit!